Palestinian leader Mahmoud Abbas has cut short a trip to Europe after a raid by the Israeli army on a prison in Jericho that sparked violent protests. The Israelis seized a number of inmates, including a man blamed for killing an Israeli minister. Mr Abbas condemned the raid - as well as the international monitors who had been guarding the jail but had pulled out because of security concerns. He was on the first day of a trip aimed at securing aid for the Palestinians. "I have interrupted my visit to return to my country," Mr Abbas told journalists in Strasbourg, France. The BBC's Alix Kroeger in Strasbourg said the trip - which was to include a speech to the European Parliament on Wednesday - was an important one. The EU, as the single largest donor to the Palestinian Authority, donates around $340m each year. But since the election victory of Hamas - a listed terrorist organisation by the EU - it has been reconsidering its position. An Israeli foreign ministry official said Tuesday's prison raid was necessary because several militants were about to be freed. 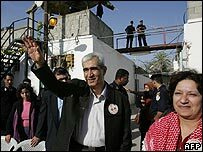 They included Ahmed Saadat, leader of the Popular Front for the Liberation of Palestine (PFLP). 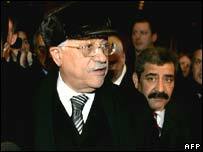 He is wanted by Israel in connection with the killing of Israeli minister Rehavam Zeevi five years ago. Mr Saadat's British lawyer, Daniel Machover, told the BBC that his client had been unjustly detained for four years. "Our client, has not been charged, tried, convicted of any offence," Mr Machover said. The PFLP warned that the seizure would "not pass without retaliation". All Palestinian factions later called for a general strike on Wednesday. The prison raid provoked angry protests and a wave of attacks against Western interests. Gunmen set fire to a British Council cultural centre in Gaza City, and attacked other UK-owned property. At least eight foreigners were kidnapped. Although some were later released, reports say one Korean and two French hostages are still being held in the Gaza Strip. The EU condemned the actions by both Israel and the Palestinians. "We strongly condemn the attack on the prison in Jericho by Israeli forces as well as the resulting kidnappings and acts of violence in the Palestinian territories," Josep Borrell, president of the European Parliament said in a statement. But the EU warned Mr Abbas that funding to the Palestinians could be cut back if attacks on EU property and kidnappings of Westerners did not stop. However it said funding agreed last month of 120m euros ($143m) would not be affected. During his trip, Mr Abbas met EU officials in Strasbourg and the Austrian chancellor Wolfgang Schuessel in Vienna. He was then to travel to Brussels and Paris after addressing the European Parliament on Wednesday.